President Xi Jinping announced today in South Africa that China will roll out 10 major plans to boost cooperation with Africa in the next three years. He proposed lifting the China-Africa relationship to a comprehensive strategic cooperative partnership, during his keynote speech at the opening ceremony of the second summit of the Forum on China-Africa Cooperation. The package of plans covers industrialization, agricultural modernization, infrastructure, financial services, green development, trade and investment facilitation, poverty reduction and public welfare, public health, people-to-people exchanges, and peace and security. The programs, will focus on helping African countries break the three development bottlenecks of backward infrastructure, talent shortage and inadequate funds, accelerate industrialization and agricultural modernization, and realize independent and sustainable development, Xi said. 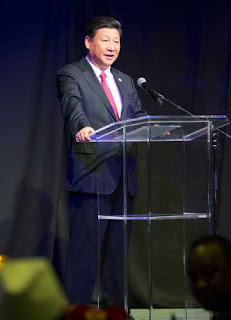 To ensure smooth implementation of the initiatives, Xi announced, China will offer US$60 billion of funding support, including US$5 billion of aid and interest-free loans, US$35 billion of preferential loans and export credit on more favorable terms, US$5 billion of additional capital for the China-Africa Development Fund and the Special Loan for the Development of African SMEs each, and a China-Africa production capacity cooperation fund with the initial capital of US$10 billion. Tesla Motors China will recall 7,166 units of Model S due to defective seat belts, China's top quality watchdog said. The affected vehicles were manufactured between May 1, 2012 and Nov. 12, 2015, according to the General Administration of Quality Supervision, Inspection and Quarantine. The front seat belts of the vehicles are not properly connected, according to Tesla. China's box office has grown by almost 50 percent so far this year to surpass US$6 billion in ticket sales. The Film Bureau says China's 2015 box office sales hit 40 billion yuan (US$6.3 billion) as of Thursday night, an increase of 48 percent year on year. China is the world's second biggest movie going market after the United States. Chinese films accounted for more than 59 percent of box office revenue. Domestic films are helped by authorities limiting the number of screens for foreign movies during prime movie-going holiday periods. 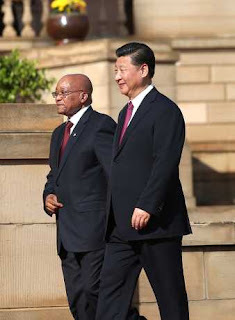 President Xi Jinping and his South African counterpart, Jacob Zuma yesterday, discussed ways to further the comprehensive strategic partnership between the two emerging economies. They agreed to elevate bilateral ties by fully implementing the 5-10 Years Strategic Plan on Cooperation between the two nations and co-chairing the Johannesburg Summit of the Forum on China-Africa Cooperation. A 21-gun salute welcomed Xi in Pretoria. This is Xi's second visit to the country. “With joint efforts of both countries, China-South Africa comprehensive strategic partnership has seen good momentum with enhanced political trust and increasingly pragmatic cooperation in various fields, which has brought about tangible benefits to the two peoples," said Xi. China will facilitate South Africa's efforts to lead China-Africa cooperation on production capability and promote Africa's industrialization, encourage more financing for South Africa, and support the early launch of the establishment of an African regional center for the New Development Bank for BRICS countries, said Xi. Zuma welcomed more investment from China and hoped the two sides could promote more fruitful cooperation in such areas as trade, technology, energy, marine products, commercial aviation and financing. South Africa, Zuma said, encourages people-to-people exchanges, and will strengthen coordination and cooperation with China within the multilateral mechanisms like the United Nations and Group of Twenty (G20), and on major global issues like climate change. The two sides will jointly chart the course of cooperation within the next three years, with an aim to accelerate Africa's industrialization process and help Africa achieve sustainable development, Xi said. The two-day Johannesburg Summit, starting on Friday, is expected to adopt a declaration and action plan outlining measures aimed at consolidating China-Africa relations. The Beijing-Tianjin-Hebei region will experience two or three periods of heavy smog later this month, a China Meteorological Administration official cautioned. 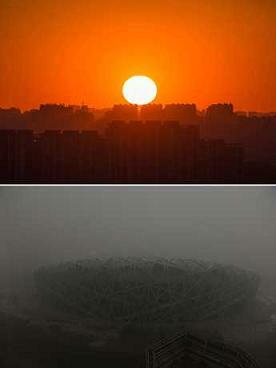 Smog is likely to shroud parts of Beijing-Tianjin-Hebei from December 8 to 10 and from December 14 to 16, although it won't be as severe as the air pollution this week, said Xue Jianjun, a senior researcher with the CMA. A former admissions officer at a top Chinese university stood trial today in the eastern city of Nanjing for taking US$3.6 million in bribes. The Nanjing Intermediate People's Court announced the trial against Cai Rongsheng, the former admissions head at Renmin University in Beijing, but the panel was not immediately available to offer updates. Prosecutors alleged that Cai took the money in exchange for helping 44 students get admitted into the university or have their majors adjusted. State media said one beneficiary was the daughter of a Hong Kong businessman. The trial was being held in the neutral venue of Nanjing to avoid possible interference. Earlier this week, the Education Ministry announced the removal of Wang Cizhao as the head of the Central Conservatory of Music after was accused of using his position to get discounted services for his daughter's lavish wedding. Yang Fangchun, vice president of Beijing University of Posts and Telecommunications, was fired after some university employees siphoned off US$440,000 from public funds into a secret stash. Liu Yadang, vice president of University of International Business and Economics, was sacked after he failed to report incomes of US$200,000 from serving on the boards of six companies. Four people were sentenced to death in northern Shanxi Province for murder, fraud and blackmail in a case involving fake mining accidents, local sources confirmed today. Wu Youxin, Chen Xiaoxin, Liu Quanyou and Liu Xianggang were suspected of killing three people between 2009 and 2011 in private coal mines with sticks or hammers, according to proceedings at the Intermediate People's Court of Yangquan City. According to the court, they then asked Wu's wife and sister or hired others to pose as relatives of the victims and demand compensation, cheating mine owners of more than 890,000 yuan. Wu, who masterminded the scheme, was fined 80,000 yuan and sentenced to death. Chen, Liu Quanyou and Liu Xianggang, who committed the murders along with Wu, also received the death penalty. They first committed blackmail in 2007, when a developmentally disabled man accidentally drowned in an underground pit. Xiong Zijin, who also stood trial, claimed to be the man's brother and blackmailed the mine owner for 165,000 yuan. Xiong split the money with the other four suspects soon after. Xiong was fined 120,000 yuan and sentenced to prison for seven years for fraud and blackmail. President Xi Jinping arrived in Pretoria today for a state visit to South Africa before co-chairing the Johannesburg Summit of the Forum on China-Africa Cooperation. Chinese officials have accused a French journalist of political bias for her reporting on Beijing's efforts to equate ethnic violence in the western Muslim region of Xinjiang with global terrorism. In response to the November 18 article by Ursula Gauthier in Le Novel Observateur, the Chinese Ministry of Foreign Affairs today criticized Western media for using double standards in reporting the violence and said terrorism should not be considered ethnic violence in Xinjiang. China blames much of the violence on the East Turkestan Islamic Movement, although many international observers question if the group exists in any organized form. Xinhua News Agency president Cai Mingzhao met with Dmitry Kiselev, general director of Russia Today International Information Agency, pledging closer cooperation yesterday. Kiselev was in Beijing to attend the first BRICS Media Summit. The summit ended yesterday after leaders of 25 media organizations vowed in a joint declaration to deepen cooperation. During the meeting, Cai said the China-Russia relationship is at its best and called on Xinhua and Russia Today to do more practical work for the development of ties between the two countries. Kiselev expressed support to the initiatives put forward by Xinhua on practical media cooperation among BRICS countries, saying his agency will reinforce cooperation with Xinhua in implementing these initiatives. President Xi Jinping’s Zimbabwe trip comes on the 35th anniversary of diplomatic relations between the countries and marks the first state visit by a Chinese president to the African country since 1996. Mainstream Zimbabwean newspapers lauded it as “historic," Xinhua reports. During Mugabe's state visit to China in August 2014, the two countries agreed to be good friends, good partners and good brothers that treat each other as equals, support each other, and pursue win-win cooperation and common development. In April this year, the two leaders met in Jakarta on the sidelines of an Asian and African leaders' summit, and pledged to make concerted efforts to elevate bilateral relations. 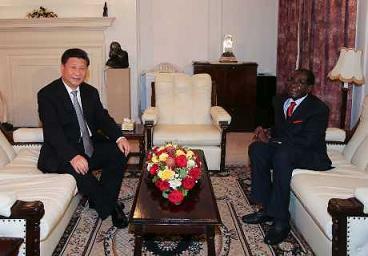 “My visit is aimed at consolidating the China-Zimbabwe traditional friendship, deepening practical cooperation and lifting bilateral relations to a higher level, so as to bring more benefits to our two peoples," Xi told Mugabe. Xi suggested that the two sides maintain high-level contact, strengthen inter-party, parliamentary and sub-national exchanges, and promote cooperation in various fields. China stands ready to shift bilateral economic and trade cooperation toward manufacturing, investment and management, and encourages more Chinese enterprises to invest in Zimbabwe, he added. The two countries also need to boost people-to-people exchanges in such areas as education, culture, health, tourism, youth and media, to gain more public support for the China-Zimbabwe friendship, Xi added.